Anyone familiar with Sitchins work will recognize this image. The following is what Sitchin has this to say about it on page 70 of his book Stairway to Heaven. If This is a real, it is a very compelling argument, Sitchin sure had me believing it back in 1999 when I read this book. Since then I have seen sitchin’s “translations” discredited thoroughly by Dr Micheal Heiser http://sitchiniswrong.com but it wasn’t until I started doing some related research of my own that I found the following archaeological smoking gun. because then by complete chance I came across this.. 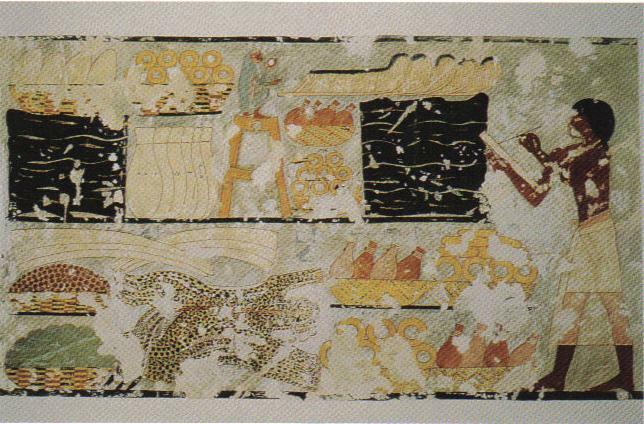 Detail of a wall painting from the tomb of a high Egyptian official, showing an Egyptian scribe recording deliveries of Nubian products shortly after Egypt's conquest of Nubia. Visible are ebony logs, ivory tusks, baskets of ostrich eggs and gold ingots, ostrich feathers, leopard skins, resins, tamarind nuts, aromatic herbs - even a green monkey. Reign of King Thutmose III (about 1479-1425 BCE). Notice that the cone at the top, Sitchins command module, is just a monkey on top of a triangular table. We see these circular golden objects in baskets these objects are why sitchin asks us to believe the following.. The silo cutaway shows that it is surrounded by tubular cells for heat-exchange or some other energy-related function…. notice the stack of leopard skins in the photo? And the while there are no giraffes or worshippers in this scene like there are in Sitchins drawing, there are on other walls of the same temple, and of the same style too. this is further evidence that this is where sitchin based his drawing from. Sitchin has added many self servicing details like the people pulling levers and hoses, and of course the "charred underbelly" of the command module y'know form reentry and all… and don’t forget the "peepholes". I suppose the reason this evidence against Sitchin has gone unnoticed for so long is because Sitchin claims this mural is in the tomb of Huy when its actually from the tomb of Rekhmire which is about a hundred years older. This has made his trail almost impossible to follow. If Sitchin claims that this isnt the mural he based his drawing off of maby he can provide us with a photo of the mural that he did seeing as how well preserved the other murals are at the temple of Huy are he should have no trouble with this. after all these years But my guess he never anticipated anyone finding this photo. This evidence, combined with the Dr Heiser’s scholarly work at http://sitchiniswrong.com which shows Sitchins dirty tricks on all aspects of his translations constitutes a serious blow, not just to Sitchn but to a lot of alternative speakers who have parroted Sitchin and used Him as the foundation for their theories…quite simply if Sitchin is wrong so are they. If Sitchin is a deliberate dis informer I think the reason is to lay groundwork for the new world orders one world religion, but in any case I think its time we start asking those kind of questions. I cannot discount that Sitchin's interpretations of the data is probably more accurate than Mike suggest. I will not debate details because I'm no Doctor; I will only give examples that can show the works of Sitchin are not too far from the truth. Who was going to use this here pillar? I'm including the whole post and pictures for posterity's sake. Their interests had been excited by the discovery of lines of neatly arranged graves which contained the skeletons of what must have been a race of human beings. They appeared to have spindly bodies and large overdeveloped heads. At first it had been thought that the caves had been the home of a hitherto unknown species of ape. But as the species seemed to bury its dead they eliminated an ape race. While studying the skeletons one of the members of the team stumbled on a large round stone disc half buried in the dust on the floor of the cave. The disc looked like an Stone Age record. There was a hole in the center of and a fine spiral groove that is a continuous spiralling line of closely written characters. No one understood the meanings of the message. The disc was labeled and filed away among other finds in the area. For 20 years many experts in Peking tried to translate the disc. Finally Dr. Tsum Um Nui broke the code and started to decipher the "speaking grooves". The Peking academy of Pre-History forbade him to publish his findings. In 1965, 716 more grooved stone discs were uncovered in the same caves. They told the story of a "space probe" by the inhabitants of another planet who came to the Baya-Kara-Ula mountain range. They had crash landed. Their peaceful intentions had been misinterpreted. Many of them had been hunted down and killed by members of the Han tribe, who lived in the neighboring caves. They referred to themselves as the Dropas. They said they came down from the clouds in their space craft. It crashed landed in remote and inaccessible mountains. There was no way to build a new ship. Legend in the area spoke of small gaunt yellow faced men who came from the clouds long ago. The men had huge bulging heads and puny bodies. They were so ugly they were hunted down and killed. This description is similar to the bodies found in the caves. On the walls of the caves archaeolgists found crude pictures of the rising Sun, the Moon, unidentifiable stars and the earth all joined together by lines of pea-sized dots. The cave drawings have been dated around 12,000 years ago. In Russia several of the rock were tested. The discs were found to contain large amounts of cobalt and other metallic substances. When placed on a special turnrable they vibrated or hummed in an unusual rhythm as thought an electric charge was passing through them. It is as if they formed some part of an electrical circuit. Chi Pu Tei, a professor of archeology at Beijing University, was leading some his students on an expedition to survey a series of interlinking caves in the Himalayan mountains. According to one account, the caves may have been artificially carved, and were more like a complex system of tunnels and underground storerooms. The walls were squared and glazed, as if cut into the mountain with a source of extreme heat. Inside the caves were several ancient, but neatly arranged burial sites, and in them the skeletal remains of a strange people. The skeletons, measuring a little more than four feet tall, were frail and spindly with disproportionately large skulls. At first. it was suggested by a member of the team that these might be the remains of an unknown species of mountain gorilla. Professor Chi Pu Tei is reputed to have responded, "Who ever heard of apes burying one another?" Yet, what kind of human was this? More discoveries made further in the caves all but ruled out the idea that these were apes. On the walls were carved pictograms of the heavens: the sun, the moon, the stars, and the Earth with lines of dots connecting them. Then the team made the most incredible discovery of all. Half-buried in the dirt floor of the cave was an odd stone disk, obviously fashioned by the hand of an intelligent creature. The disk was approximately nine inches in diameter and three-quarters of an inch thick. In the exact center was a perfectly round, 3/4" hole, and etched in its face was a fine groove spiraling out from the center to the rim, making the disk look for all the world like some kind of primitive phonograph record. This one plate, dated to be between 10,000 and 12,000 years old -- older by far than the great pyramids of Egypt -- was fantastic enough, but the wonder was multiplied manifold. In all, 716 such plates were found. And each held an incredible secret. The groove, upon further inspection, was not a groove at all, but a continuous line of strange carved hieroglyphics -- writing! The tiny, almost microscopic characters were in a language never encountered before. It wasn't until 1962 that another Chinese scientist was able to decode the message of the stone plates. Dr. Tsum Um Nui felt the smooth face of the disk with the palm of his hand. "What could this disk possibly be?" he wondered. He knew of its recent history; how it was discovered in 1938 by a Chinese archaeologist in a cave high in the Himalayans, along with 715 similar disks; how buried nearby were skeletons of a strange tribe of people averaging only a little over four feet high; how it was found that each disk was inscribed with a tiny groove that spiraled around its face, and that the groove turned out to be an unknown hieroglyphic. He also knew how the disks, as remarkable as they were, had been simply labeled along with other finds of the expedition and stored away at Beijing University for 20 years. During that time, others had attempted to decipher the strange inscriptions, but without success. Perhaps now, in 1962, he could. The professor painstakingly transcribed the characters from the disk to paper. The writing was so small he had to use a magnifying glass to see it clearly. But the stones were old -- perhaps 12,000 years old, it was estimated -- and much of the hieroglyphics were difficult to make out or had been worn away by time and the elements. As he worked, many questions nagged the professor. How did these primitive people fashion these precise stones? How did they manage the almost microscopic writing? Who were they and what was the purpose of these hundreds of stones? Once the characters were transcribed, Dr. Tsum Um Nui began the arduous task of trying to decode its message. Eventually, he began to make progress. A word emerged. Then another. A phrase became understandable, then an entire sentence. He had broken the code. He discerned that the messages on the stones were written by a people who called themselves the Dropa. But what they were saying to him 12,000 years later made no sense. What the Dropa had written must have been one of their cultural myths, or was part of some prehistoric religious ceremony. Or was it? When he had completed the translation as much as he could, the professor sat back in his chair in disbelief. The story the Dropa related was nothing short of astounding. How would his colleagues react? How might the world react if this story was true? The professor wrote up a paper on his findings and presented it to the university for publication. Their reaction was swift and emphatic: the paper would not be published. The Academy of Prehistory expressly forbade him to publish or even speak of his findings. The world, the academy decided, should not know about the Dropa and their fateful journey to Earth. Dr. Tsum Um Nui's findings were eventually published, however. Just two years later, he published the paper entitled, "The Grooved Script Concerning Spaceships Which, as Recorded on the Discs, Landed on Earth 12,000 Years Ago." By some accounts, the academy relented and gave permission to the professor to publish the paper, and by other accounts he published it despite the official ban. In either case, his translation and his theory were met with ridicule by the archeology establishment. The translation was just too shattering to be taken at face value or as an historical account. It just could not be true. It would change everything we know about our history and humankind's place in the universe. The Dropa disks tell the story of a space probe from a distant planet that crash-landed in the Baian-Kara-Ula mountains of the Himalayas. The occupants of the spacecraft - the Dropa - found refuge in the caves of the mountains. Despite their peaceful intentions, the Dropa were misunderstood by members of the Ham tribe who were occupying neighboring caves and who hunted down the aliens and even killed some of them. A translation of one of the passages says: "The Dropa came down from the clouds in their aircraft. Our men, women, and children hid in the caves ten times before sunrise. When at last they understood the sign language of the Dropa, they realized that the newcomers had peaceful intentions." The stones go on to say how the Dropa were unable to repair their disabled spacecraft and could not return to their home planet, and so were stranded on Earth. If that's true, have their descendants survived? Today, the isolated area is inhabited by two tribes of people who, in fact, call themselves the Dropa and the Han. Supposedly, there also is an ancient Chinese tale that might bear-out the Dropa's claims. The tale relates the story of a small, slender, yellow-skinned people who descended to the Earth from the clouds, and who were shunned by everyone because of their ugliness. 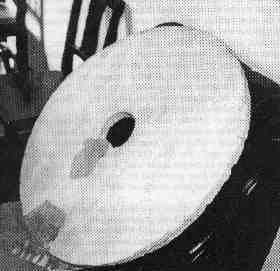 In 1968, the Dropa stones came to the attention of W. Saitsew, a Russian scientist who re-published the findings of Tsum Um Nui and conducted tests on the disks that revealed some very peculiar properties. Physically, the granite stones contained high concentrations of cobalt and other metals -- a very hard stone indeed that would have made it difficult for the primitive people to carve the lettering, especially with such minute characters. When testing a disk with an oscillograph, a surprising oscillation rhythm was recorded as if, the scientists said, they had once been electrically charged or had functioned as electrical conductors. Whatever their true nature, origin, or meaning, the Dropa stones present an intriguing puzzle for archaeologists and anthropologists. Were the Dropa truly visitors from some distant planet, or is their story merely a creation myth imagined by a primitive culture? If the latter is true, it adds one more such "myth" to the large number of stories from ancient cultures that claim their descendants came to Earth from the heavens. And if the former is true, the Dropa stones could represent the first recorded visit of an alien civilization to our planet. For now, the Dropa stones remain unexplained. They seem to be modern day verification of the Dropa stones! Just two years ago we had nine planets. Finding Eris is number ten, not only validating the Sumerian accounts but Sitchin as well. The list is huge man... besides we all knew reading Sitchin's work that they were his interpritations of the Sumerian text. He states that clearly in his book "The 10th Planet" but for Mike Heiser to suggest that Sitchin cannot even read the language is ludicrous. Sitchin might have made mistakes but I think the evidence is in. Great follow up post, Bhang! And glad You started this thread, Gensix. Both posts led me to some very good research and insights. I believe more and more and more real history, like that of the Dropa, is going to be traveling around this ol' world moreso right now then it ever has. An awakening of the third kind is taking place. This picture was taken by Dr. Karyl Robin-Evans during his 1947 expedition shows the Dzopa ruling couple Hueypah-La (4 ft. tall) and Veez-La (3 ft. 4 in. tall). These pictures came from Evan's book "Sungods in Exile"
Funny that on the Sitchin is wrong website there is not one thing that says he or she can read ancient Sumerian. Sitchin has had many who say he is wrong, I think this is because he is close to being right on everything. The NWO does not want anyone to know what they know, and rest assured that they know how to decipher the tablets too. Nibiru is being tracked right now, if not, why are all the expensive, large telescopes all pointed south? I don't think Sitchin got everything correct, nobody could do that. Most of his theories check out. Of course Gensix would post a thread like this. Same guy (?) who has an agenda with Michael Tsarion. Can YOU read Sumerian, Gensix?